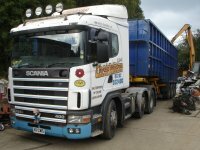 Chris Watson and Sons near Colne, Lancashire, operates an extensive vehicle dismantling facility where customers can buy a wide range of parts and auto spares for cars and commercial vehicles. Our main trade is vehicle parts sales and recycling but we also require a constant flow of ferrous and non-ferrous scrap metals, which can be brought to us for the highest prices available or collected by us at a reduced price per tonne. As car breakers we are always looking for new stock for from all sectors of the motor trade and private owners too. The aim of our business is to offer the highest quality parts and service at the best possible price to members of the public and businesses alike. We stock up to 950 vehicles of all makes and models ranging from 1950s to present day with new stock arriving daily. We buy accident-damaged vehicles, M.O.T. failures and unfinished projects from the public, trade and associations. Vehicles can be brought to us or we can collect from our local area. We dismantle all types of vehicles and meet all requirements of the End of Life vehicle directive which is closely monitored by the environment agency who have verified our status as an authorised treatment facility. The processing facility is concreted with the latest depollution and herring drain system. Any road legal vehicle is road tested by a qualified technician to evaluate usable parts and a report is kept before being depolluted on site. We are ELV (End of Life Vehicle) registered and our operations are based in northern England. As you browse our website you will see that we are committed to value, service and the environment, recycling and reselling everything we possibly can to extend its useful life and thus save natural resources. We also stock and supply an amazing range of car parts, so whatever you're seeking to complete your project, it's just possible we've got one - give us a call to find out! Call us now on 01282 812400 to get up to date information on our car parts, or to enquire about scrapping your end-of-life vehicle, or to gain an up todate price for scrap metals. And, of course, we'll be happy to see you in person at our yard in salterforth , Quarry Works,Moor Lane, Salterforth, Colne , Lancs, BB18 5SP . Dont waste it, Re-use it if you can, Recycle it if you cant.